Tour Travel, IT Company, Software Solutions. Travel and tour operators are able to offer a bouquet of packages and offers to clients thanks to the increased connectivity via internet with agencies, customers and partners. Their network has grown to cover the entire globe with services ranging from ticketing, hotel bookings, to package deals for multiple locations. 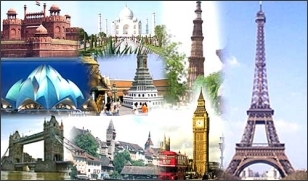 They are able to market themselves well on the internet among the growing number of internet users who are looking for an economical or luxurious travel plans. We design websites and applications that are used by travel and tour operators to collaborate with partners and agencies from around the world and generate leads to make use of their offers. The use of mobile devices for communication enables them to share every minute detail of the operation and stay ahead in terms of disaster control. We also offer solutions to prepare itineraries and coordinate with tour operators and travellers. Our administration tools and enterprise applications can be used to design travel plans and manage budgets for the same. Travel and tour operations is a complex business as individual customers, hotel booking, flight/train /bus booking, has to be managed simultaneously and synchronised appropriately to ensure that the trip goes smoothly and the customers keep returning for a good experience.